On the coast of Northumberland, just south of Amble, two late Neolithic to early Bronze Age cists were discovered. 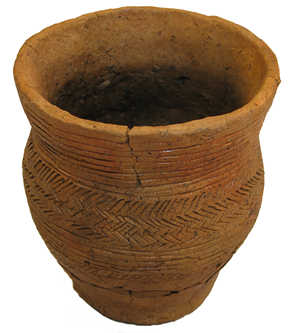 The first cist was constructed of stone, and was filled with a layer of animal bone and a complete Beaker. The second cist was also constructed from stone, and this contained the skeleton of a young adult and another complete Beaker. Both cists were then covered over with a rubble mound. 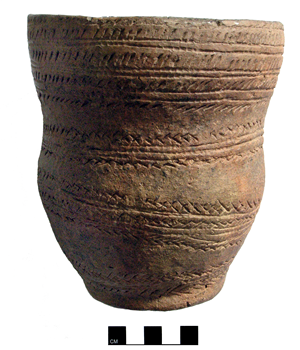 The beaker in the second cist is of the all over corded type, decorated with linear cord impressions and incised diagonal marks. 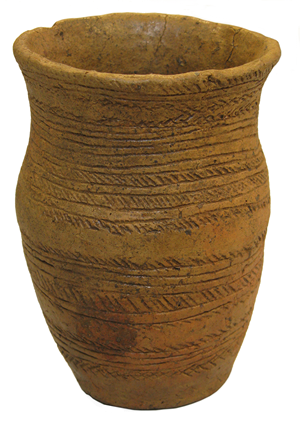 The decoration is uneven in places, and the whole vessel is very reminiscent of another unprovenanced beaker believed to be from Tyne and Wear. Perhaps these two pots were made by the same potter? The other Beaker is quite different. This is decorated with a wider range of patterns, with sections of cord impressed linear decoration on the neck, shoulder and body of the vessel interspersed with sections of cord impressed herringbone. It is interesting that this pot was buried in a stone cist, but as far as we know there was no person buried with it. Pots such as these take a great deal of time and care to make, and are usually found in burials. Perhaps a burial was intended to go in this cist, or maybe it was removed.